Car Seat Covers & Mats. Car Power Adapters & Inverters. Models Auto Art & Kyosho. Models Film & Tv DieCast. Models Mondo Diecast & Others. 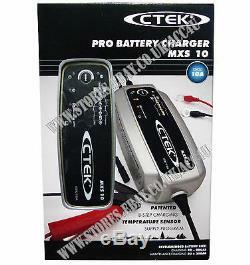 CTEK MXS 10 Pro 12v 10A Smart Intelligent Car Battery Charger. The MXS 10 is a charger that offers state of the art technology. 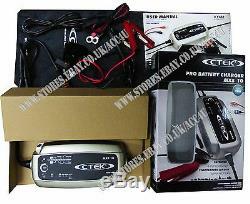 It is ideal for professional use and excellent in workshops, caravans, motorhomess, boats or cars. The MXS 10 is perfect for solving a broad range of battery problems. It offers features such as battery diagnosis which shows if a battery can receive and retain a charge, a special reconditioning function which restores stratified and deeply discharged batteries, unique maintenance charging and a temperature sensor for optimised charging regardless of the weather conditions. It also has a power supply mode which allows the battery to be disconnected from the vehicle without losing important configurations. The unique display allows the user to follow the entire charging process. 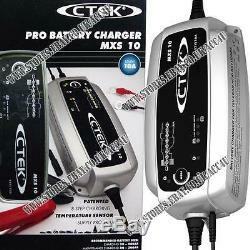 The MXS 10 is a fully automatic 8-step charger that delivers 10A to 12V batteries from 20-200Ah. The charger is IP 65 rated (splash and dust proof), designed to protect vehicle electronics, non-sparking, reverse polarity protected and short-circuit proof. Input Voltage: 220 - 240v AC, 50 - 60Hz. Fitted With 3 Pin UK plug. 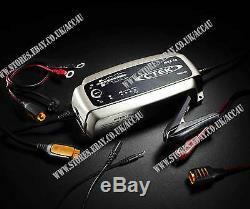 Output Voltage: 14.4v, 14.7v, RECOND 15.8v, SUPPLY 13.6v. Ambient Temperature: -20 Degree C to +50 Degree C, Output power is reduced automatically at higher temperatures. Charger Type: Eight step, fully automatic charging cycle. Batteries: 12v Lead-Acid batteries (WET, MF, Ca/Ca, AGM and GEL). Recommended Battery Size: Charging: 20Ah - 200Ah. Maintenance Charging: 20Ah - 300Ah. Does not damage sensitive electronics. Spark proof, reverse-polarity protection and short circuit proof. Includes Temperature Sensor which is attachable, if so the charger will compensate voltage according to ambient temperature. Activated temperature sensor will be indicated by a lit temperature sensor indicator lamp on the charger. Also includes Comfort Connect - Clamp and Comfort Connect - eyelet M8. Dimensions Approx (L x W x H): 197mm x 93mm x 49mm. This Item is Brand New. To avoid any complications please take few moments to read our terms and conditions. Or See terms and conditions of sale. Ireland, Islands and Scottish Highlands. There may be a courier surcharge depending on the size and weight of the parcel. For Full Details and Costs. In event of a very unlikely slight delay, your patience would be much appreciated. For Full Terms and Conditions Details. We are a United Kingdom registered limited company specializing in the sales of interior & exterior car accessories, automotive leisure, vehicle security and breakdown essentials, car audio, die-cast models, bike accessories, and novelty products. We are growing from strength to strength and are always adding new lines to our stock. To avoid any transportation damage all items are checked and sent well packed. All customers will also be sent an invoice with the VAT number and our full address. We pride ourselves on offering to our customers, unrivalled customer care at all times. For More Details About Us Including Contact and Feedback Details. Or See Our me Page. This listing is currently undergoing maintenance, we apologise for any inconvenience caused. 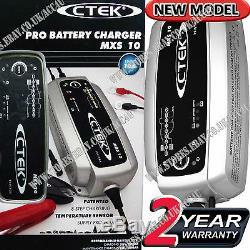 The item "CTEK MXS 10 Pro 12v 10A 8 Step Fully Automatic Car Van 4x4 Smart Battery Charger" is in sale since Saturday, January 17, 2015. 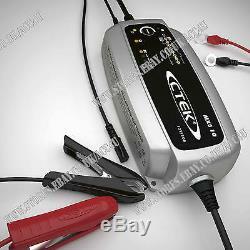 This item is in the category "Vehicle Parts & Accessories\Car Accessories\Battery Chargers, Conditioners".